FEW people leave the UK to buy a home in France on their own. But Daily Telegraph columnist Michael Wright did just that when he left the easy life of London behind to ‘toughen-up’ in Limousin. And in his book C’est La Folie, Michael charts his progress from theatre critic to rugged paysan, as he shepherds his sheep, chats with his chickens and tackles the renovation of his dilapidated home. From his first days in France he has to take the initiative to ensure he becomes part of the local community, even if this means taking a beating in a local tennis tournament and drowning out the congregation with the church organ. The journalistic skills of Michael Wright come to the fore with his fun descriptions and passages of dialogue – his trip to the pharmacy to track down medication for one of his chickens is very funny. But underlying the whole book is Michael’s transition from the unfulfilling life he was leading in London, where his work was becoming repetitive and his familiar questions were being answered with the same sentences. So instead of just putting up with things he decided to change direction and sell up, with just his cat for company and a blank page ahead of him. And it is that fresh start that Michael Wright has embraced, both with his writing and his life in France, and is something that those who have made the move should grasp as well. 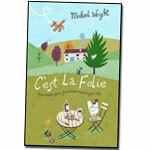 On Amazon you will found out more about C’est La Folie by Michael Wright, and if you buy a copy then I receive a small commission which helps keep This French Life up and running. This is the best book I have read in ages. It had me laughing out loud. This is not a common occurence as I am a full time carer for my severely disabled son, and life generally isn't a load of laughs. When will the next book be out, Michael, and I'll bin the Prozac? Many thanks for dropping in on This French Life and I must agree C'est La Folie is one of the funnier books about life in France. I found this book excellent, so droll, so touching, so personal and so vivid. Merci mille fois, Michael. La Folie recoit des touristes sympa, je me demande? Hi David, many thanks for your comment and you are right that C'est La Folie offered some real personal insights.